LYNNWOOD -- Adam Fenster recently resigned as the women's soccer coach at Edmonds after one season at the helm. The Tritons went 9-7-2 under Fenster, and resurfaced as a playoff team after a three-year hiatus. The program is now looking for its next head coach. "Adam decided to take his life in a new direction," said athletic director Spencer Stark. "We wish him well in his next endeavors and thank him for the last two years here at Edmonds (Fenster was an assistant in 2017)." Triton women's soccer has won four North Region titles, and two Northwest Athletic Conference championships (2000 & 2002). The Tritons play their home matches at Triton Field, on a soccer pitch that is one of the largest in Snohomish County at nearly 40,000 square feet. The multi-sport complex is lighted, all-turf, and is shared by all outdoor sports. "I really feel we have a great situation for someone to step in here and continue what Adam started last year. There is a great group of sophomores returning, and Triton Field is a great soccer facility," said Stark. Freshmen forwards Katy Ewoniuk (South Sandy, Utah) and Mariah Davis (Lynnwood, Wash.) were all-league selections this past fall. 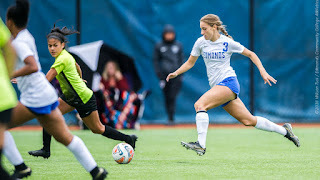 Defender Lexi Ramirez (Lake Stevens, Wash.) also returns after being named to the NWAC All-Star Team. The search for a new head coach is underway. For information on the job, go here. The position is open until filled. "We have our hiring committee ready; our goal is to have the next head coach in place by March 1 so they can get their feet under them, hit the recruiting trail, and to be ready for the spring season on April 1," Stark said.